Soup is my desert island food. Especially if it is a cold and wintry desert island! Soup is so simple to make, so easy to vary, so soothing to eat. Once, long ago, I queued up in the New York snow for cheesecake. It was totally worth it. And what did we eat beforehand? Sandwiches and borscht. The soup was nearly as memorable as the cake. I chopped up many a beetroot trying to make something similarly sweet and sour, thick and warming, but it never lived up to that bowl of purple nourishment. 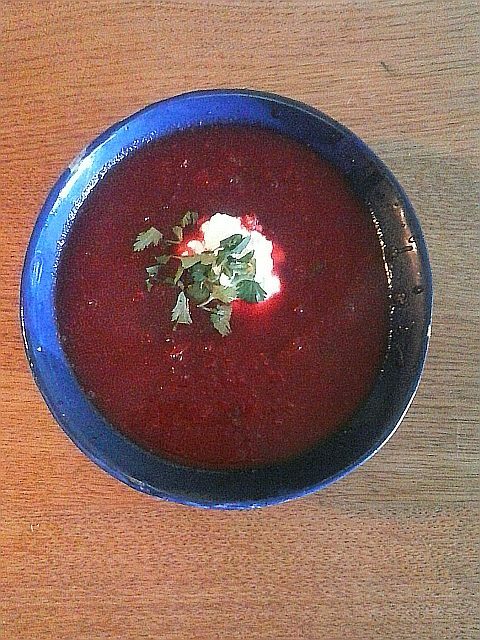 This is not borscht, but it is very hearty and delicious. And purple. The sun-dried tomato adds a deliciously savoury note. Highly recommended. 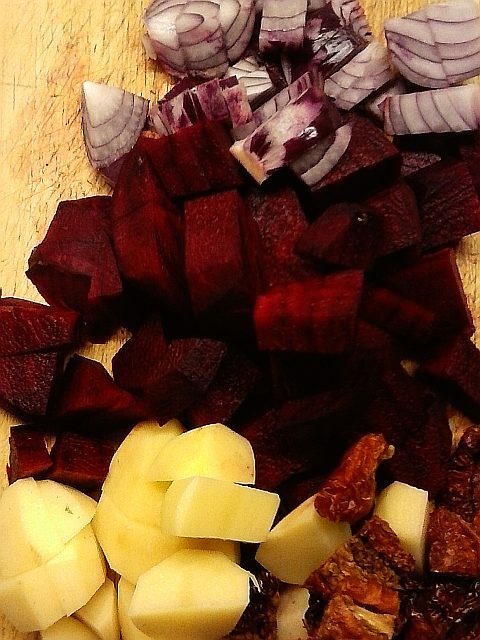 Peel and chop the beetroot and potato into dice. Chop the onion and sun-dried tomatoes fairly finely. Put into a saucepan with the stock or water, the tomato paste and caraway. Simmer for about half an hour until everything is tender. Now blend until you have the desired consistency, making it as smooth or chunky as you like. Season to taste with lemon juice, sugar, salt and pepper. Serve, topped with a spoon of sour cream or yoghurt and sprinkled with a little coriander or dill. Hi Anna, yes please do!